If you are planning for that ultimate honeymoon whose memories are to be etched into your minds forever, here comes the award winning Hotel Conrad Rangali Island Maldives with its exciting honeymoon- suite for all you newlyweds. Being one of the finest hotels in the world it already swaggers of having several luxurious villas, striking beach villas and marvelous spa water villas. But the honeymoon suite is something that will sure make you fall for it. 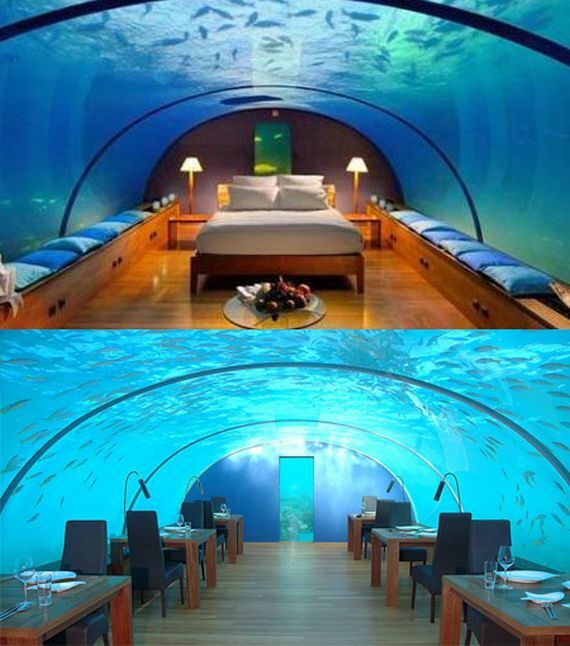 After all, who wouldn't love to spend a night underneath the sea with panoramic views of the marine life? 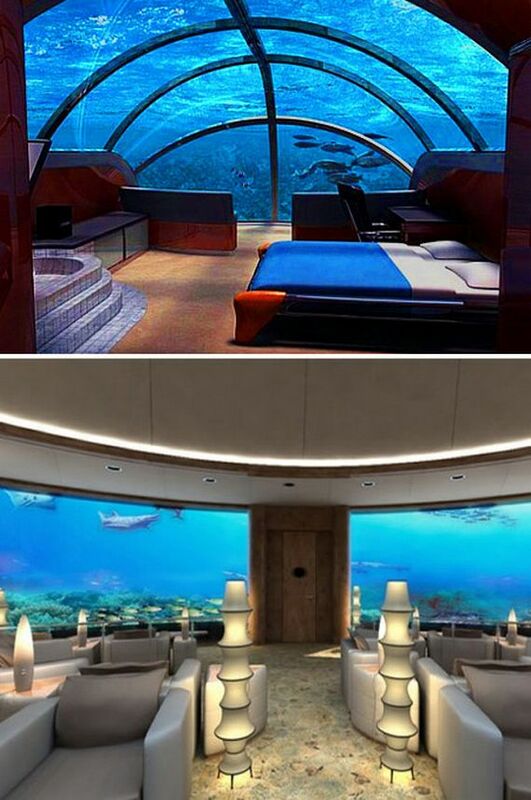 Giving the phrase "Under the sea" a whole new meaning, the Poseidon Undersea Resort($15,000 and up) lets you rest underneath the waves in a room made mostly of acrylic glass. Located in Fiji, the resort offers guests private plane transportation from a Fijian airport to the Poseidon Mystery Island, where they'll enjoy a week's stay — including two nights in the underwater hotel, with a three-passenger Triton 1000 submarine at their disposal. 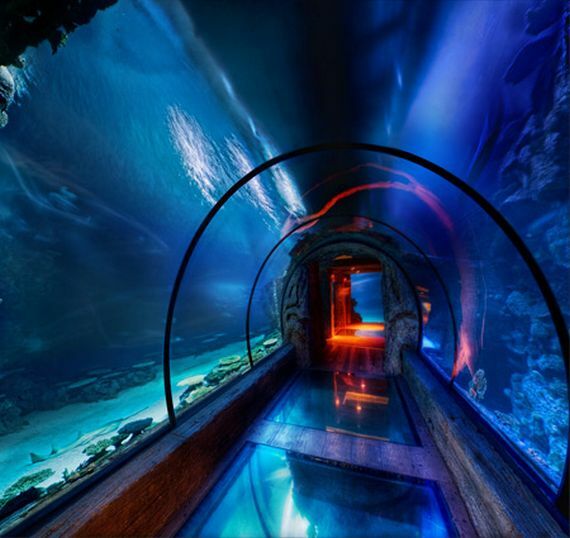 With a coral reef to explore, beach bungalows for above-sea level accommodations, an underwater library, wedding chapel, restaurants, and more, it's an out-of-this-world experience just 40 feet below the surface. The Red Sea Star has been receiving extensive coverage throughout the world since its establishment, especially because of the unique concept it was based on, its exceptional construction process, its fascinating interior design and the fact that it is a "green" project, which contributes profoundly to the preservation of the coral reef surrounding it. The Red Sea Star enables you to "sense the sea" through a "dry diving experience" and to discover the magnificent and exciting underwater world of the Red Sea. A breathtaking view of hundreds of various tropical sea creatures in the colorful coral garden is seen through 62 panoramic amorphous windows surrounding the observatory, located five meters below the sea level. 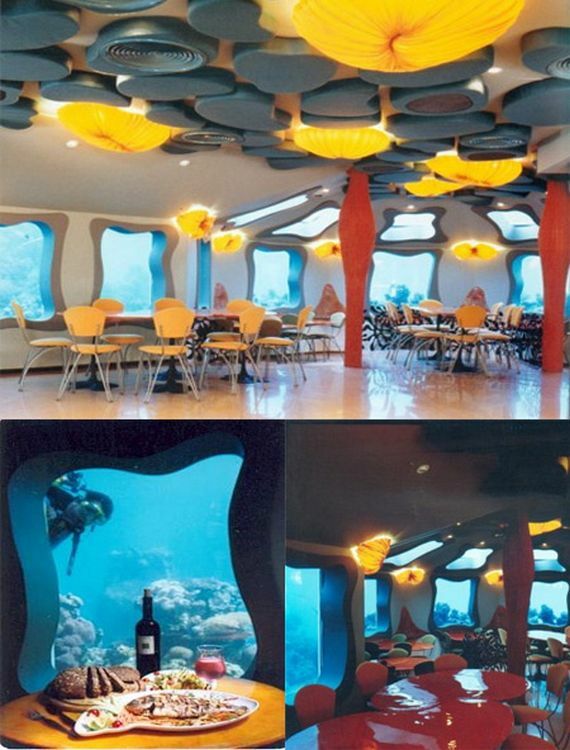 What began as La Chalupa Research Laboratory in Key Largo, Florida, is now Jules' Undersea Lodge (though it still has the fully operational Marine Lab). 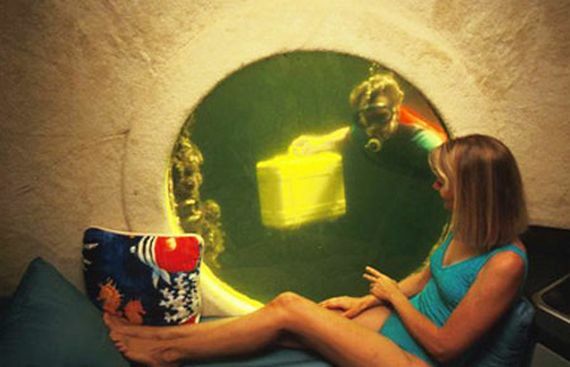 To enter the lodge, guest must dive down 21 feet through the Emerald Lagoon with trained professionals leading the way. Located five feet above the bottom of the Mangrove lagoon, the lodge has a common room to keep guests entertained, as well as a fully stocked kitchen, dining area and communication center. Meet the first Sculpture Park in Grenada. 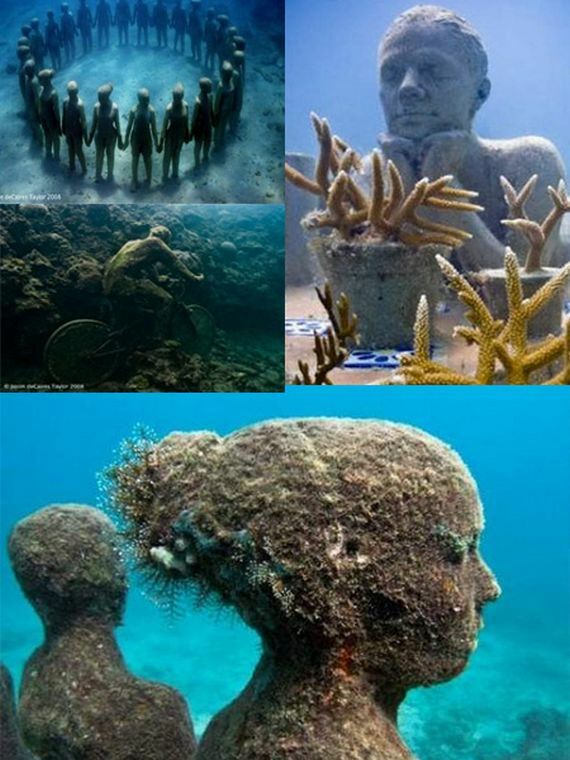 Located at Molinere Bay, the original sculptures were designed by British sculptor Jason de Caires Taylor, who is working on a similar project in the waters around Cancun. Officials say the sculptures have had a positive impact on the underwater ecosystem by allowing for the creation of artificial reefs. Snorkelling or diving in the Sculpture Park is considered a ‘must do' by many visitors to Grenada. In the Serpent Slide (located in the Atlantis Paradise Resort, Bahamas), guests travel on a tube at high speeds through the darkness of the Mayan Temple's core (another slide). 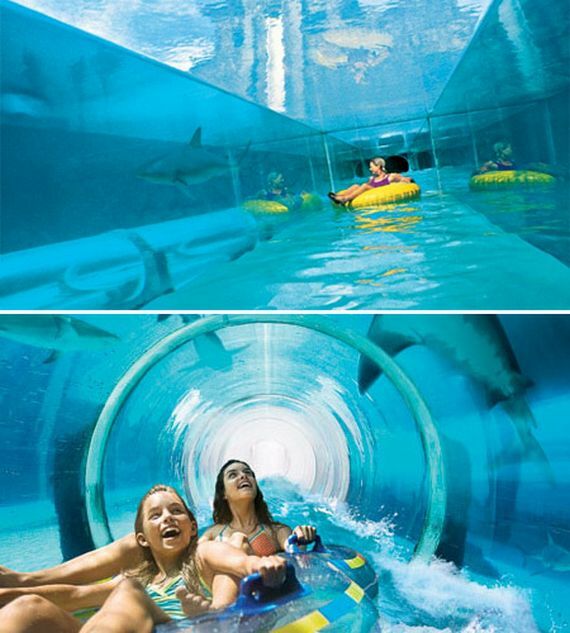 The twisting and turning ride culminates with a leisurely pass through a clear acrylic tunnel submerged in a shark-filled lagoon. Lake Mälaren in Västeras, Sweden, is home to the very quaint but beautiful Utter Inn. Transportation to the inn starts with an inflatable boat ride from the port of Västeras. 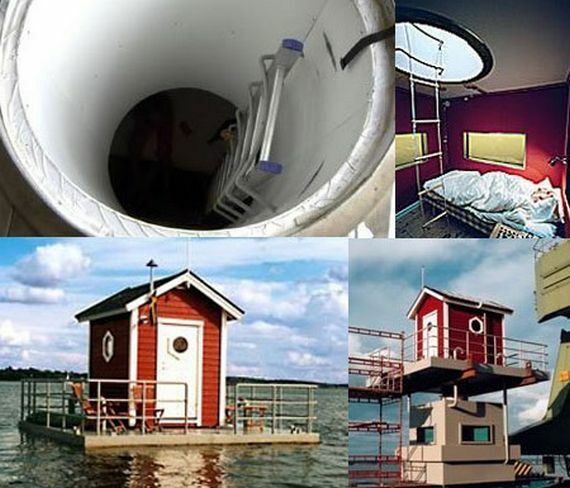 Then guests enter through a Swedish-inspired house that floats on the surface of the water and travel below to reach a room completely surrounded by windows, thus providing a perfect view of the creatures living below the surface. Relaxing activities include swimming, sunbathing and going for canoe rides—and dinner is delivered by boat. 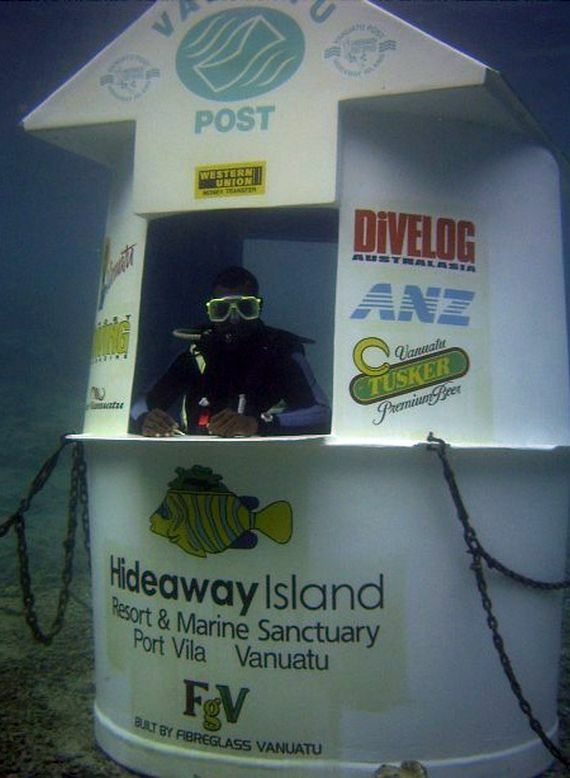 Vanuatu's Underwater Post Office, found just off Hideaway Island near Port Vila, has quickly become one of the busiest post offices for postcards in the world! Visitors from around the world have literally donned their mask and snorkels, postcards in hand to experience the world's first underwater post office. And they have not been disappointed. The Post Office is only 50 metres offshore and at just three metres below the surface, is very accessible to the young and young at heart. Thousands of visitors have posted one of the special waterproof postcards available in Vanuatu; these cards are collected regularly by one of Vanuatu Post's four trained scuba divers and “cancelled” underwater with an embossing cachet. Mail that requires a normal Underwater Post Office date stamp is cancelled in the Main Post Office. Bali is the most beautiful and idyllic place to arrange your marriage. The tropical climate and the mystical ambience of “The Island Of The Gods” makes Bali the perfect location for a wedding or a honeymoon. For more than 50 years Bali has been a popular destination to get married. BIDP now offers a dream wedding in Paradise. Enjoy a full day of boating in Bali and choose from the most suitable of ceremonies offered! 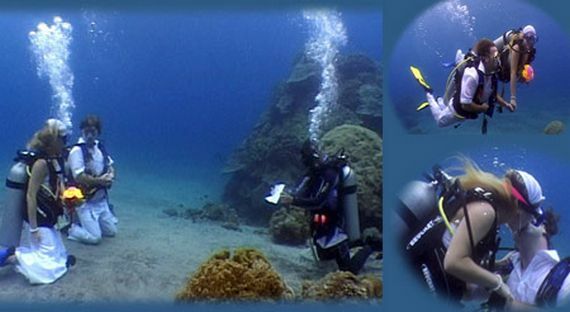 The Underwater Wedding can be organised for certified divers and people who have never tried scuba diving before. Non certified divers will be asked to have an Intro Dive course before the wedding day without extra charge and the ceremony must be concluded in a pool setting in that situation. The Shark Reef and Aquarium at Mandalay Bay is an excellent showcase for adults and children of all ages. The viewing cost is about 15$ for adults and is discounted for children; the price seems pretty reasonable in comparison to other shows and exhibits in Las Vegas. There is a large variety of fish, sharks, jellyfish, stingrays, etc. 5 responses to "10 Coolest Underwater Places!!!"